Ottawa has gone through a dry spell this year. There have been few restaurant openings and even fewer who have made a really big splash. So, when you discover an oasis like Fairouz, you lap it up with purpose. “A modern journey through the Middle East” is the tagline of the newly opened eatery; although, when I think of Middle Eastern cuisine in Ottawa, the word modern hardly comes to mind. Instead, I think of the definitive Shawarma and the many, many establishments that serve it up so well. 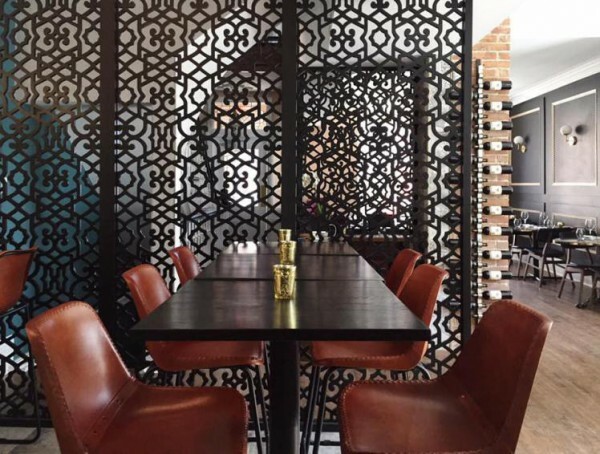 To conjure up an image of modern Middle Eastern fare, in an upscale yet casual dining atmosphere? Formerly, I would have been at a loss. First, hats off to Walid El-Tawel, the Executive Chef at Fairouz. Reigning from a prestigious position at restaurant E18hteen, El-Tawel now has the creative freedom to curate a menu that is unlike any other in Ottawa. Each dish at Fairouz is seamlessly woven with ribbons of flavour, calling forward authentic Middle Eastern hints that harmonize beautifully with El-Tawel’s modern style. The menu progresses from lighter appetizers in the “Grazing” section to more hearty dishes classified as “Sharing”. But, let’s start at the very beginning, shall we? The Labneh, Mutabel and Muhammara are three dips that are not to be missed. The Labneh, a thick strained yogurt, was spruced up with a dash of the most delectable zataar spice. The Mutabel is a traditional Middle Eastern dip similar to Baba Ganoush and the Muhammara is sweet and spicy. All three dips beg to be devoured without the use of utensils and are accompanied by fresh pita bread that is baked to order, in-house. The grazing section has my attention. What’s next? 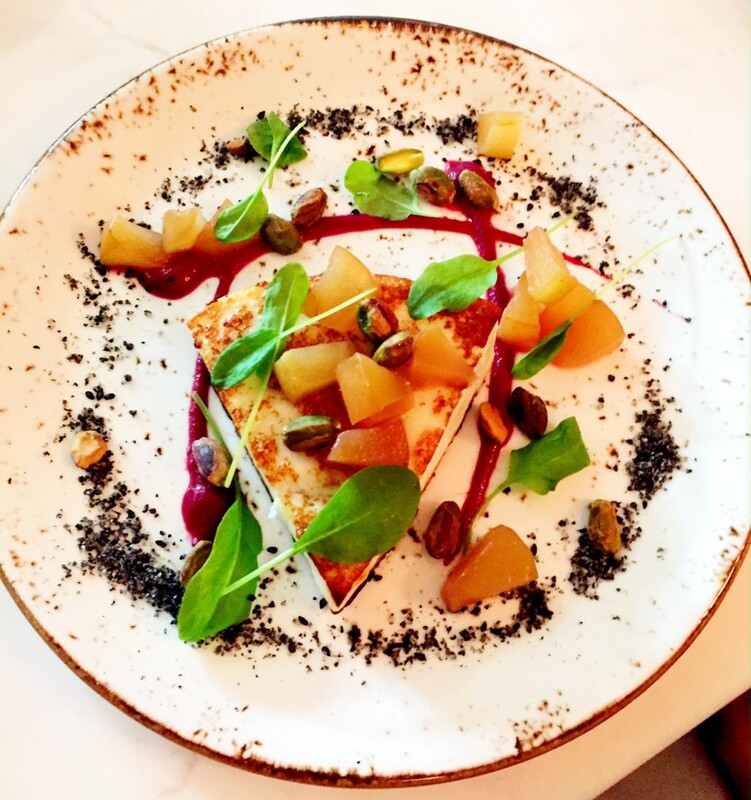 The Monteforte Halloumi topped with double apple is a take on the double apple hookah (!). Surprisingly delicious, this “double apple” is far more subtle than its vaporized cousin, but stands its ground as a pleasant contrast to the saltiness of the halloumi, while pieces of pistachio bring texture to the soft cheese. Red Lentil Koftë is a vegetarian’s delight and a cheeky spin on a dish that is traditionally made with lamb. Bright acidity from pickled pink turnip and pomegranate plays against the robust texture of lentils, served atop lettuce leaf boats. 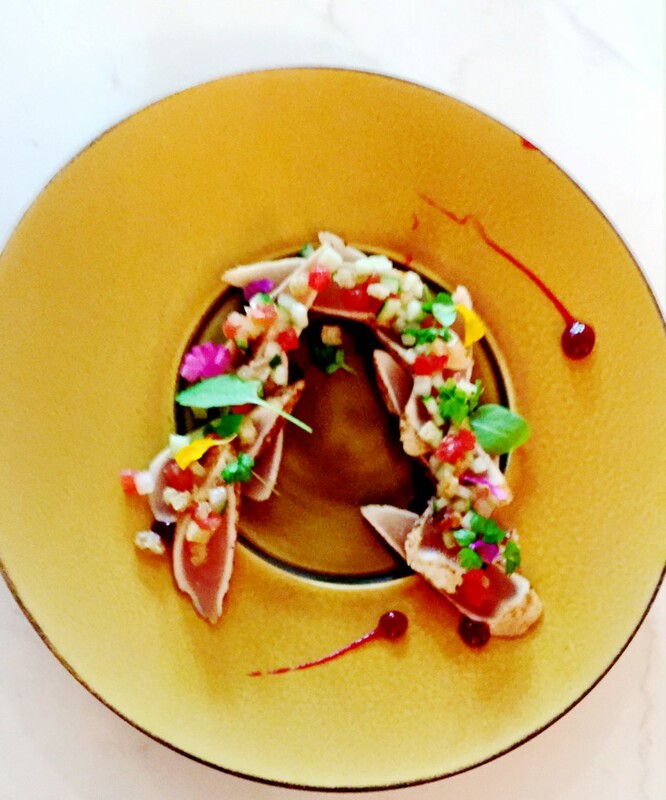 Tuna Maslouka is a thoughtful addition to the menu with unlikely flavours of baharat and hibiscus that instantly reincarnate the common tataki-style dish. 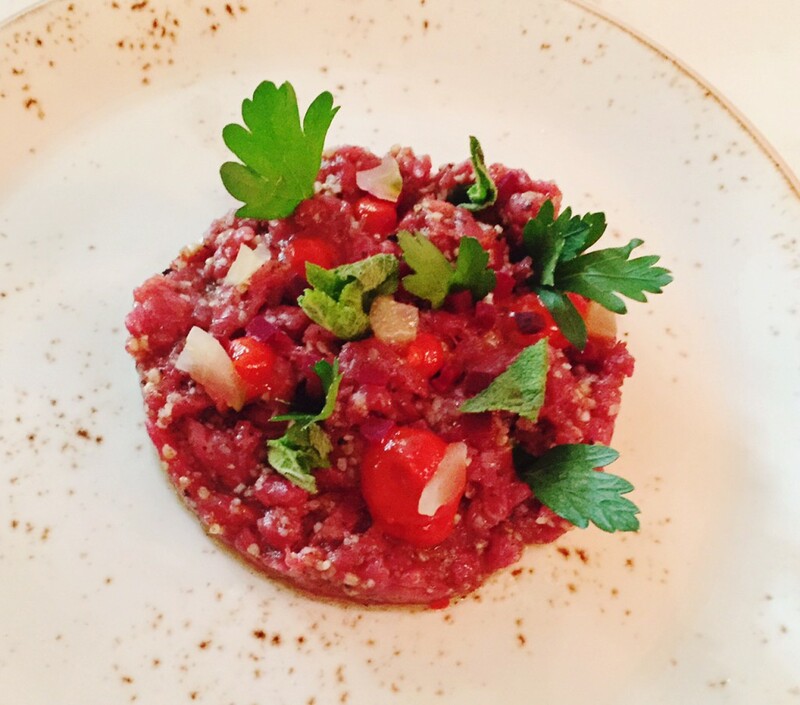 In a similar vein, the Lamb Tartar plays up the ever-so-popular steak tartar; but, El-Tawel doesn’t shy away from reinventing this fan-favourite either. Smokey harrissa lingers in each bite of the quintessential Middle Eastern protein. From the “Sharing” section, I can only speak to two dishes: the chicken and the duck. Not one to habitually opt for chicken, I would without question order the Sumac Glazed Chicken again…and again… and again. The chicken is a succulent, melt-in-your-mouth kind of bird. Cooked to perfection, its accoutrements are equally decadent. Though the term “date leather” lacks appeal, the sweet flavour of rich dates complement the spices of sumac and charred onion. Serve this up with a side of the Jawareh Rice – a sweet style of rice with cardamom, candied orange, pistachio and pomegranate – and your taste buds will be dancing. The Berebere Spiced Duck was equally tender and delicious but with more subdued Middle Eastern flavours. The saffron béarnaise foam was a delightful addition alongside a tart Persian barberry jam. Not expecting that ANYTHING could surpass the aforementioned dishes in flavour or in creativity, I casually ordered a Turkish coffee and a dessert that seemed destined to be paired with it: the Turkish Coffee Dondurma. The flavours in this delightful ice-cream treat were intricate, with bursts of cardamom tamed by deeper hints of mocha and arak – a liqueur similar to that of Sambuca. The wine list – curated by sommelier Adam Weiss – is condensed, thoughtful and impressive, with a spattering of Lebanese wines (hello, Chateau Musar!) in both the white and red category. Not forgotten are some familiar Canadian wines, with varietals that showcase the best of Niagara’s terroir. Wines by the glass and by the bottle take us through a well-rounded European tour including a few fun odd-balls from Greece and Sicily. The cocktail list at Fairouz is yet another beautiful thing. It’s a playful nod to Middle Eastern landmarks with names like “Wadi Rum”, referencing a valley cut into sandstone rock, and “Petra’s Garden”, presumably a reference to the southern Jordanian city, famous for its rock-cut architecture. The vibrant cocktails are crafted with artisanal ingredients, shaken and stirred with the utmost care. This highly sensory journey through the Middle East would not be complete without the sights that accompany it. The design, by Ottawa-based designer Kayla Pongrac, is inimitable. Pongrac has created a space that is timeless, yet true to the opulence of the Middle East. Ornate wall installations are contrasted by the crisp, clean lines of marble countertops. 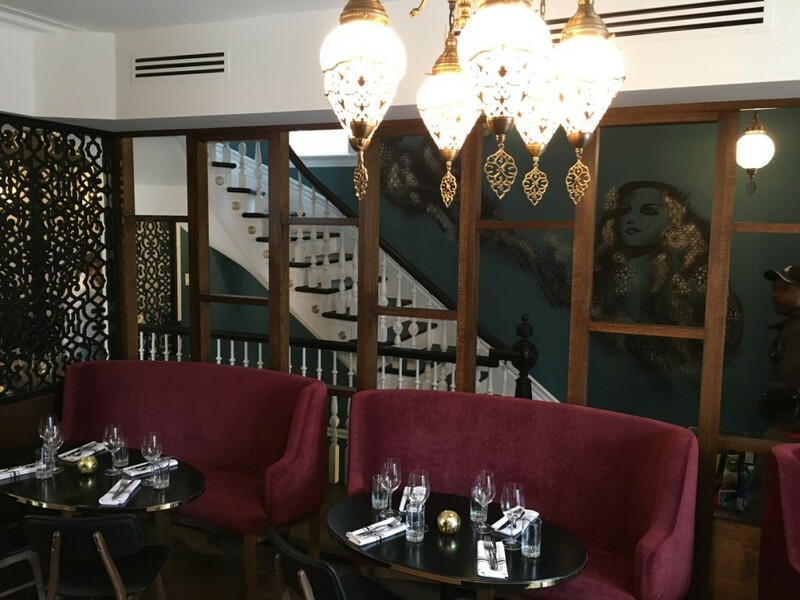 The hand-drawn paintings ascending the staircase depict the Middle Eastern performer, Fairouz. Elaborate custom-made chandeliers are suspended above plush plum booths. 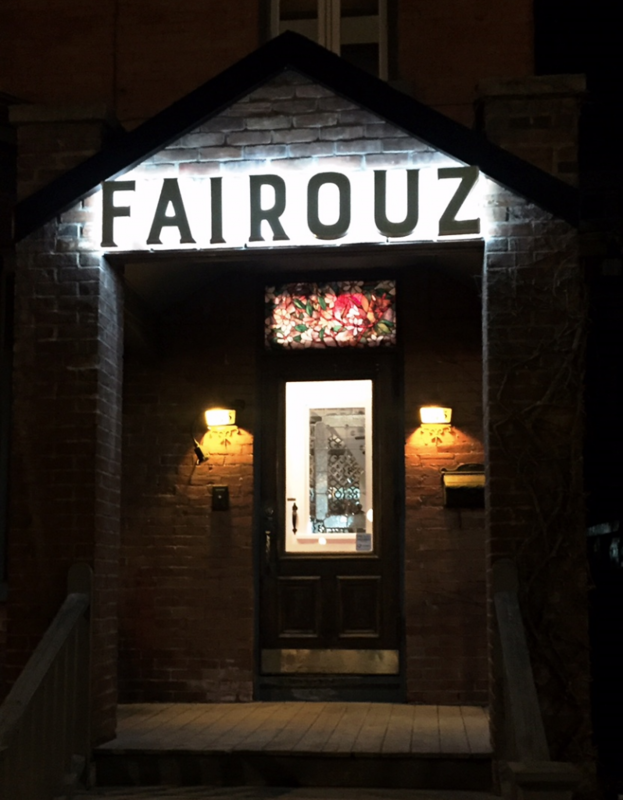 In this striking space, an elevated standard of service is matched by the ingenuity – in food, in drink, in design – making Fairouz a rare gem. From conception to execution, owners Dr. Hussain Rahal and Tony Garcia, have flawlessly delivered what Ottawa was lacking in casual fine dining. WOW! Looks FABULOUS. I’m hungry. great review! I ate there on the 24th and the food was good and very fresh. My one “beef” is that there was no vegetarian Falafel-only the ones with a mixture of lamb. Overall the meal was great, but some of the sharing plates were quite small. Now this is what I’m talking about! I think all cultures and nationalities deserve to shine and showcase more than just street food… This makes me want to open my Armenian restaurant even more!! !